I hope you guys are all doing well — I have lots of catching up to do in Blogville! Trying to get back into a routine, for eating, working out, and blogging. It feels good to have a schedule of some sort. I finally admitted to myself that my breakfast sandwiches aren’t quite the same when I use sandwich thins. They just don’t fill me up as much. So I finally went back to using light english muffins. 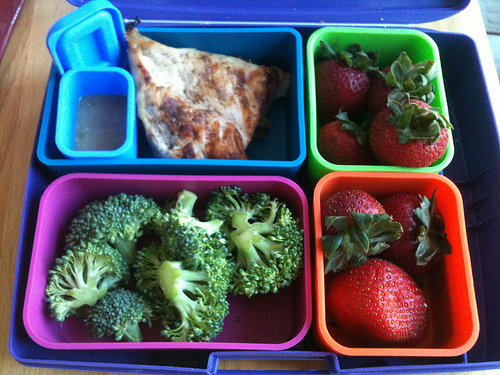 Leftover grilled chicken, some mojo marinade to use as a sauce, broccoli, and fresh strawberries. 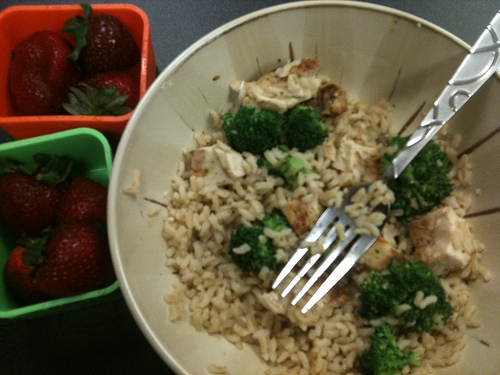 I had some brown rice at work that I heated up with the chicken and broccoli to make a nice and healthy lunch. 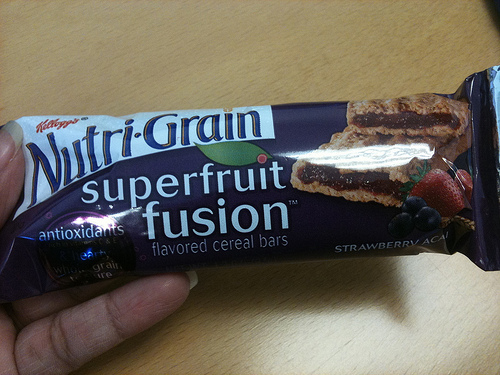 For afternoon munchies, I packed a snack-sized bag of Sun Chips, which I forgot to take a picture of, and a Nutrigrain bar. After work I made myself go to the gym. I’m trying to get back in the habit now before fall tax season gets here. Which is next week — we’re supposed to start working at least 50 hours a week. Suckage. Dinner was very very simple. 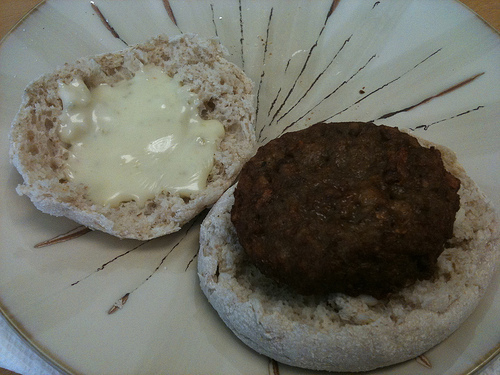 I find that when I’m trying to eat healthier, my food tends to be simple. It’s like I choose separate items as opposed to a recipe, if that makes sense. 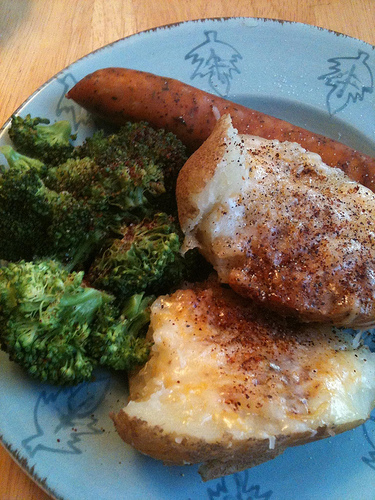 Baked potato topped with shredded cheese, steamed broccoli, and a chicken andouille sausage. Not bad and I’m not really in a dessert mood either. Here’s a Chloe pic to end the night! 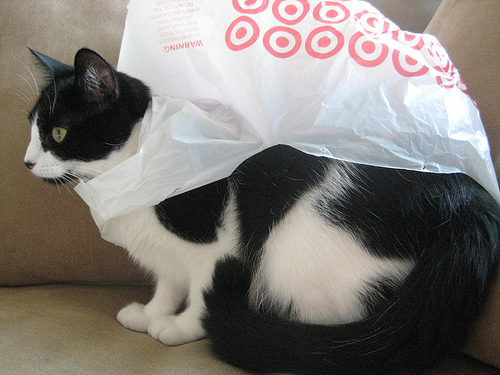 She has this obsession with plastic bags and loves licking them. She stuck her head in one to lick it and ended up sticking her head through the holes and made herself a cape. Super Chloe to the rescue! Next post: The Wizarding World of Harry Potter and a Fun Giveaway!